SAAT Admission Application Form from this webpage. It is big opportunity for all candidates who are willing to take admission in under graduate / post graduate course. Those contenders who want to get complete details of SAAT Admission Application Form they need to read this webpage wholly and carefully. Huge numbers of candidates every year attends Siksha ‘O’ Anusandhan University Admission Test to take admission in this university but only they gets admission on applied course, who gets qualify in Siksha ‘O’ Anusandhan University Admission Test with required marks. Students are required to apply online and then attend Siksha ‘O’ Anusandhan University Admission Test in First week of May. Official advertisement of SAAT Admission Application Form is stated below for all students who want take admission in UG/PG in Engineering, Pharmacy, Nursing, Management, Hospital Administration, Hospitality and Tourism Management, Law & Agriculture. courses. So at first read official advertisement completely and then apply online. All candidates who are willing to take admission in Siksha 'O' Anusandhan University they must fill up admission form before final date that is Third week of April. 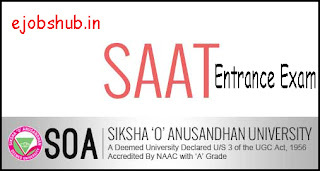 Admission form of SAAT can be filled with the help of official website of Siksha 'O' Anusandhan University that is soauniversity.ac.in. Applicants may bookmark this web page by using Ctrl+D key to grab latest info of SAAT admission application form. All associated details to take admission are provided here for ambitious candidates. Under Graduate and Post Graduate courses in Engineering, Pharmacy, Nursing, Management, Hospital Administration, Hospitality and Tourism Management, Law & Agriculture. Pass/Appearing 10+2 or equivalent examination and secure at least 50% marks. Age Limit: Lower age limit is 17 years & Upper age limit is 25 years. 5 years relaxation in Upper age limit for SC/ST. Pass/Appearing 10+2 examination with not less than 50% Marks (40% marks SC/ST/PH). Age Limit: Lower age limit is 17 years & Upper age limit is 23 years. Pass or Appearing at 10+2 examination with at least 45% Marks (40% marks SC/ST/PH). Pass/Appearing in B.E. / B.Tech / AMIE /MCA/M.Sc. or equivalent and obtain at least 50% marks. Note: GATE qualified candidates are exempted from the entrance exam, but they have to submit the filled up form. Pass/Appearing three year Bachelor Degree with at least 50% marks (45% in case of SC/ST/OBC Category). Note: Candidates having Business mathematics at +2 or +3 level are not eligible. Pass or Appearing Bachelor Degree or equivalent with at least 50%marks (45% SC/ST/OBC category). Pass or appearing B Pharma examination and obtain at least 55% marks (50% marks for SC/ST/OBC category). Note: GPAT qualified candidates are exempted from the entrance test, but they have to submit the filled up form. Pass/Appearing three or four years Bachelor Degree with at least 50% marks (45% in case of candidates belonging to SC / ST/ OBC category). Passed B.Sc. Nursing Degree with 55%. Pass/ Appearing Diploma candidate with less than 60% marks. Pass or appearing three year BCA, BSCIT and B.Sc. in Computer Science with at least 60% of marks. Selection Process: Selection of the candidates will be based on rank obtained by him/her in the merit list which will be subjected to the availability of seats for the course chosen by the aspirant at the time of counseling. Mode of Examination: The exam will be conducted through online mode i.e. the examination will be a computer based test. Time Duration: Candidates will be given the total time of 1 hour to complete the examination. Marking criteria: For each correct answer 4 marks will be given to the candidates. Negative Marking will be there as 1 mark will be deducted, for incorrect answer. Mathematics, Computer Fundamentals/ Programming Languages/ Operating Systems. Admission will only be done on the basis of the rank obtained by the applicants and the choice of the course that the aspirants have to make at the time of counseling. Students who will be called for the counseling session they need to bring their rank cards along with them. Contenders who will be qualified in the counseling session will be regarded as the eligible one for the admission in SOA University. Students will receive a registration number and a university registration card after the session. M Tech / MCA / Lateral Entry MCA - Rs.1,28,000/- Per Annum. Lateral Entry B Tech. - Rs. 2,01,000/- Per Annum. B Pharm. - Rs.1, 19,000/- Per Annum. MHM / MTTM -Rs.78, 000/- Per Annum. MHA - Rs.88, 000/- Per Annum. M Pharm. - Rs.1,28,000/Per Annum. BHMCT - Rs.75, 000/- Per Annum. M.Sc. (All) - Rs.68, 000/- Per Annum. B.Sc. Nursing (Basic /Post Basic) - Rs.89,000/- Per Annum. BA LLB - Rs.89,000/- Per Annum. BBA LLB - Rs.89,000/- Per Annum. LLM - Rs.89,000/- Per Annum. BBA - Rs.88,000/- Per Annum. M.Sc. Nursing - Rs.1, 08,000/- Per Annum. HOSTEL FEES Establishment Fee - Rs.42,000/- Per Annum. Transportation Fees (optional) - Rs.15,000/- Per Annum. At the time of online allotment the candidates are required to pay online an initial amount of Rs.1, 000/-. The mess charges will be approximately Rs.30, 000/- p.a. (as per actual). The hostel fee is applicable for current academic session. Re-admission fees: Rs.4, 000/- is chargeable from candidates who have discontinued their course due to any reason including disciplinary action. Open check the Fees Structure to get info about Fees Structure. Students who have desire to take admission in MBBS / BDS course they need to apply online with their marks at 10+2 (Physics, chemistry, Biology & English) level and All India Rank, Percentile of marks obtained in NEET. Students will be appointed based on the merit list and eligibility of the aspirant applying. 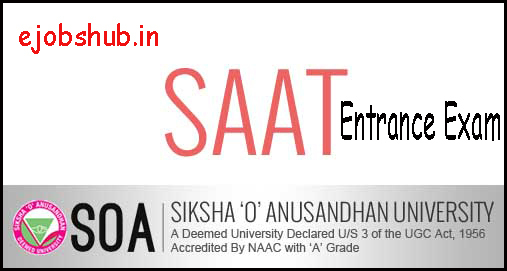 On the home page, press on the “SAAT Entrance Test and Admission (Apply Online)” link. Go on the “Admissions” tab and open it. Press on the “Hit here to Apply Online”. Candidates need to fill online application form with all details. At last, take Print out for future use.